2. Whisk together yolks and brown sugar. 3. Stir heavy cream, vanilla and spices into yolk and brown sugar mixture. 4. Pour crème brûlée mixture into your ramekins. We had enough to fill 3. 5. Place ramekins into a baking dish and fill baking dish with hot water about ½ way up the side of the ramekins to create a water bath. 6. Carefully place the baking dish into your oven and bake for 30-35 minutes. 7. 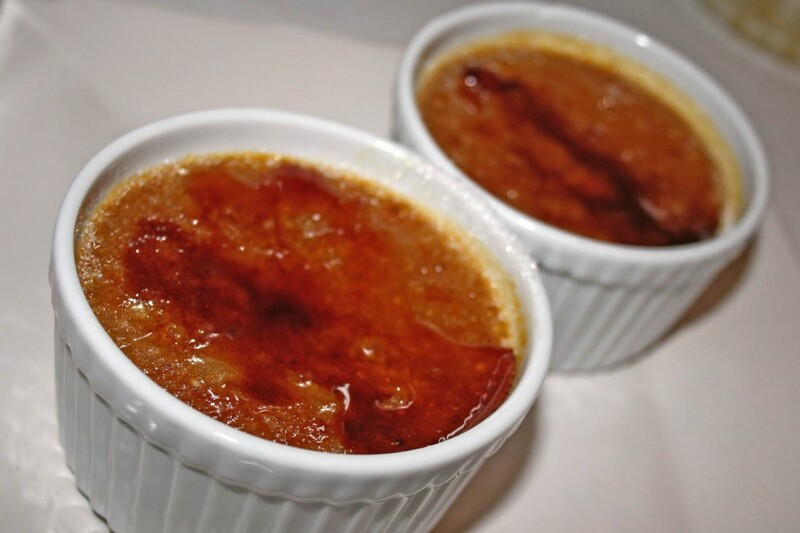 Chill cooked crème brûlée for 2 ½ hours in the refrigerator. 8. Coat tops of crème brûlée with the granulated sugar and caramelize with a Culinary Torch. This entry was posted in Dessert, Eat and tagged Autumn, baking, caramelize, cooking, creme brulee, culinary torch, dessert, easy, fall, heavy cream, pumpkin, ramekin by autumnadams4. Bookmark the permalink.